What is sharding in MongoDB? 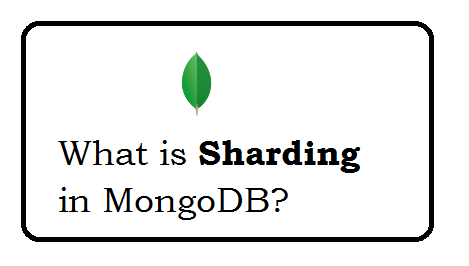 Question: What is sharding in MongoDB? Sharding is a method for distributing data across multiple machines and its MongoDB's approach to meeting the demands of data growth. With increase of the size of the data, a single machine may not be sufficient to store the data OR read and write data. to fix this problem there are two different methods. Vertical Scaling: Increase the capacity of single server and increase the power. Horizontal Scaling: dividing the system dataset and load over multiple servers. We can use multiple server for storing and read/data data. Using multiple server is lower cost than single machine with high-end hardware but increase the complexity in infrastructure and maintenance for the deployment. Question: What are MongoDB Query Capabilities? Sorting on one/multiple fields with ascending/descending order. Projection (Retrieving only specified fields from each document in the cursor, not the entire document). Cursor skip() and limit() to easily implement pagination. explain() will return the detail on query will help to optimize the query. Question: How to database details? Question: How to collection details?